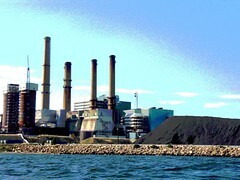 Ahead of a peaceful anti-coal protest planned Sunday at Massachusetts' Brayton Point power plant, Somerset Police Chief Joseph Ferreira has invested $30,000 of town funds in full riot gear. Click the link so you can see the accompanying picture - the chief had his officers pose for media looking ready for war while brandishing billy clubs. You get the feeling that if the protest is as peaceful as its planners intend, Chief Ferreira will be disappointed. I don't understand people who say wind turbines are eyesores that ruin the view. Personally, I like looking at them - simple & elegant. Even on mountains, in fields, or in the ocean, they seem to belong there harnessing nature's abundance. But even if you don't like looking at them ... well, so what? Since when did we start holding new projects to that standard? Big box stores, highways and power lines aren't exactly works of art, but we put up with them because they perform important services and support jobs. We should be at least that willing to tolerate things that collect clean, affordable, locally-produced energy. Now go like Friends of Fairhaven Wind. There's a new victim of Fairhaven's elected officials since their decision to let wind hypochondriacs call the shots: Democracy. As those officials have felt more heat from ordinary clean energy-supporting citizens, they've started abusing open meeting laws, excluding the public and going into private sessions on a regular basis. 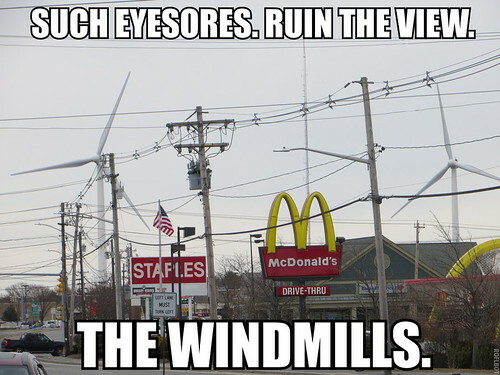 As it is, Fairhaven Wind has opted for "let 'em spin." How can they be faulted? The Department of Environmental Protection found [noise] violations only when the wind blows from the northwest and northeast and only in winter, never in July or August. With all due respect to those reporting ill effects from the spinning blades, this is giving us a headache, too. Complaints about the turbines have reportedly disappeared since the Board of Health "solved" the problem by ordering the turbines shut down at night. But if wind turbines really do cause all the problems that "wind turbine syndrome" advocates claim - headaches, nausea, herpes - wouldn't people still be getting sick during the day? I guess this placebo is not only fast-acting, but provides 24 hour relief! Also at risk of disappearing if the overnight shutdown continues: At least $50,000 in annual revenue for the town. Show your support for clean energy by liking the Friends of Fairhaven Wind page on Facebook. New England climate movement leader Craig Altemose and several other concerned citizens have co-signed a letter to the Internal Revenue Service urging it to investigate the Alliance to Protect Nantucket Sound after its repeated failures to properly document its donations and expenses. They point out that the Alliance to Protect Nantucket Sound has forwarded $394,000 to the Town of Barnstable to pay for its litigation against the Cape Wind project, America’s first offshore wind farm, and has failed to properly account for these grants as required in its recent Form 990 filings. It's part of an admitted strategy by the Kochs - invest in the political process to maximize their own interests and profits. But they know that billionaire polluting energy kingpins are the least-persuasive public spokesmen possible, so they fund a series of front groups and puppet spokespeople to make their case for them. And on top of that, the politicians they fund constantly fight for laws to help hide that funding and its connections. All that stands in stark contrast to clean energy and its supporters. Cape Wind's conservation, public health and labor allies are so transparent they put all their names on one website. Show your support for Cape Wind by asking federal regulators to speed the development of clean, affordable offshore wind energy. The Keystone XL tar sands pipeline would cook our climate, threaten wildlife and drain money from American families. What's not to like? That the House Republican farm bill would quite literally starve low-income families while shoveling billions in subsidies to agribusiness corporations? BOOOO-RING. But hey, did you hear who's going to a pancake breakfast in Iowa this weekend? 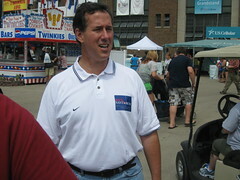 The Iowa caucus is only 30 months away! Never mind that it's failed to predict the Republican nominee two cycles in a row. HORSE RACE! It's on! Your national political news is almost always filtered through the lens of someone who's white, middle to upper income, lives in the DC or New York City suburbs, drives more than relying on walking/biking/transit, never worries about where their next meal will come from, cares much more about political spin than policy impact, and thinks everyone sees the world the exact same way. As Ezra Klein often says, "The first rule of being a political junkie is to always remember that you are a very weird person, and most people are not like you." Seems like very few political journalists ever get that introspective. 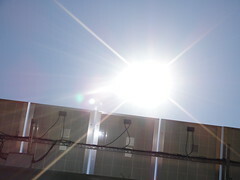 The Georgia Tea Party supports diversifying the state's energy sources to take advantage of the Peach State's abundant solar energy, saying consumers have the right to choose where their electricity comes from. Right now, Georgia utilities provide only gas-fired, coal-fired, and nuclear power, with only tiny amounts of hydro-electric and other renewable energy mixed in. But Koch Industries founded the Tea Party to fight limits on corporate pollution, not promote solar power. So the Koch collective is now sending piles of cash to put down the pro-solar insurrection, as Kiley Kroh reports at Climate Progress. The moment anyone bucks the pro-polluter party line, those Tea Party muskets of freedom turn into a firing squad. Ask The Green Miles: Are Smart Cars the Greenest Choice? When folks ask me for advice on car-buying, they almost always bring up Smart Cars. They're so small, they must be the most fuel efficient, right? But smallest size doesn't necessarily mean the best fuel efficiency. Sure, the Smart ForTwo gives you a really good 36 miles per gallon combined city/highway at a very low base price. But a nice gas-sipping subcompact - say, a Ford Focus or a Toyota Yaris - will give you very similar fuel efficiency (low 30s) with TWICE the passenger volume for only a couple of thousand more. If you're a short-to-medium distance commuter, all-electrics like the Ford Focus Electric or Nissan Leaf will deliver absolutely amazing savings on fuel cost and pollution. And for folks who regularly make longer drives and need a hybrid, the Toyota Prius is still king. The Environmental Protection Agency's FuelEconomy.gov gives a great rundown of the most fuel-efficient cars, along with the most and least fuel-efficient SUVs and trucks. That brings me to a related pet-peeve: When people think I'm reflexively anti-SUV. Yes, if you're a single person driving a Chevy Suburban because you might go skiing once next year, you're wasting money and polluting our air for absolutely no reason. But if you need some room for your family, get a Toyota Highlander Hybrid and you'll be getting only somewhat worse mileage (28 mpg combined) than those Smart Car drivers. My cousin Rebecca Billings and her documentary partner Jacob Wise are kickstarting project on Vancouver Island's old-growth forests. Watch the video below, then if you can spare it, kick them $10 to help their project to protect these ancient wildlife habitats. IndieGoGo Promo Video from Jacob Wise on Vimeo. Top Wildfire Fighter: "We've Had Climate Change Beat Into Us"
Just posted to the National Wildlife Federation blog on how climate change is fueling the Arizona wildfires and may be permanently changing Western wildlife habitats. The National Journal's Amy Harder fantasizes about how President Obama could lay the smackdown on his administration's own experts and anyone who wants a stable climate by approving the Keystone XL tar sands pipeline.